Last Thursday, the complaints of business owners and restaurant workers in national park gateway towns around the West hit home when my boyfriend’s parents, who were about to embark on the Southwestern leg of their once-in-a-lifetime cross-country road trip, realized the shutdown had foiled their entire itinerary for the region. Instead of snapping pictures from the South Rim of the Grand Canyon or the shadow of Arches National Park’s Delicate Arch, they motored through, stopping at tribal parks and taking pictures from the car window. They were two days too early. On Saturday, governors in Utah, Arizona and Colorado reached a deal with Secretary of the Interior Sally Jewell to re-open select national parks with state and private funds. While the timing of the re-opening was frustrating for my boyfriend’s parents, it came not a moment too soon for tourism-dependent towns like Moab and Springdale, Utah, Estes Park, Colo., and Tusayan, Ariz., which were reeling at the prospect of a Columbus Day weekend – and possibly an entire October – without visitors. Indeed, as a report released last week by the Coalition of National Park Service Retirees makes clear, the closure of our national parks has already taken a huge economic toll on surrounding communities and on the National Park Service itself. But the use of state funds to pay national park staff fuels the arguments of people like Rep. Rob Bishop (R-Utah), who believe states should have more control of federal land. “’If anything,’ the shutdown has shown that states and localities may be able to manage the properties better than the federal government,” he told E&E News. 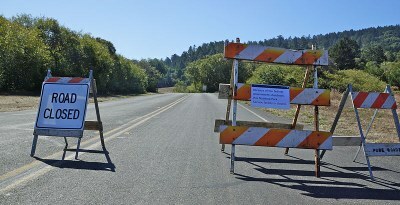 Point Reyes National Seashore in California closed for the federal shutdown. Though the state control issue has reared its head around the West for years, the momentum is strongest in Bishop’s home state, where in March 2012 Governor Gary Herbert signed a law requiring the feds to turn ownership of some 20 million acres over to Utah by December 31, 2014. Utahans have also recently tried to limit federal land agencies’ ability to enforce the law, declare state jurisdiction over “mismanaged” federal forests and limit federal management of endangered species – and keep the feds from having any input on these proposals. Now, state Rep. David Lifferth is drafting a bill that would allow Utah to operate its national parks if the feds are unable to do so. But as HCN’s Jodi Peterson wrote last year, the motives behind state control of federal lands aren’t so pure. “The rhetoric behind the measures is all about states' rights, but they would also boost corporate access to Western natural resources,” she wrote, noting that the fossil-fuel funded American Legislative Exchange Council supplied the language for Utah’s proposal. Not every Western governor is gunning to run national parks. Although Colorado, Utah, South Dakota and Arizona forked over hundreds of thousands of dollars ($1.7 million in Utah) to re-open parks for the next 10 days or so, many other cash-strapped Western states have said they simply can’t afford it. The time of year also helps explain why some states, like Utah, jumped at the chance to re-open their parks, while others are hanging back. October is a huge tourism month for canyon country in sunny, hot Utah, generating $100 million in that month alone. But fall isn’t nearly as popular for tourists in much chillier Montana, where Kevin Gartland, executive director of the Whitefish Chamber of Commerce, told The Helena Independent Record “if this was July or August, we’d be up in arms." Economic diversification in park gateway towns in recent decades also plays a role in how various localities are responding to the shutdown. In 1995, during the last shutdown, Carlsbad, N.M. raised money to keep Carlsbad Caverns National Park open. But that’s not happening this time around, Park Superintendent John Benjamin told the Current-Argus. That park is staying closed, at least for now. "I think one reason is that today, unlike back then, the economy is not as dependent on tourism because of the oil and gas boom. Tourism is still important to the community, but it appears not as crucial as it was in the mid-1990s." Benjamin was set to retire the week of the shutdown, but has continued to act as superintendent because there wasn’t time to appoint someone else. "Someone had to be at the helm to provide guidance and take on the responsibilities that still come with the shutdown," he told the Current-Argus. "I really don't know if I'm officially retired, so here I am." Emily Guerin is a correspondent for High Country News. Follow her on Twitter @guerinemily.